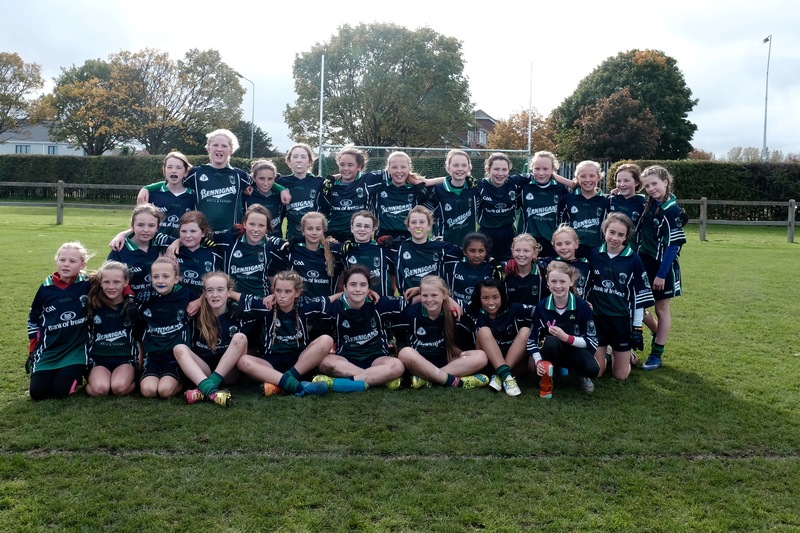 Last Sunday we had over 33 girls from the U11âs travel out to Naomh Barrog GAA club for the Dublin blitz. This blitz was divided into four groups. Foxcab put out three teams of 11 players each. Between each team they came up against the home team Naomh Barrog and Fingal Ravens. The under-11s produced an outstanding performance, with all three teams excelling themselves in terms of tight-handing passing, fierce tackling and a very high rate of finishing, resulting in some very good scores. Our Foxcab girls came away with 6/6 wins which is incredible for this young group of girls. All the girls displayed impressive teamwork with some tremendous blocks and vision from defence while the mid field and forwards concentrated on working together, retaining possession while building up their scores. The FoxCab girls, right across the three teams, never allowed their opponents to settle and put unrelenting pressure on them whenever they had the ball. Their constant hard work at training on a Tuesday night was evident throughout the matches on Sunday. This team has taken tremendous strides forward in terms of fitness levels, team play and skill levels. The behaviour of this team and their attitude towards training and matches is exemplary. From their attention to team talks to their pre-match warm-up, this team are almost like a professional outfit. The girls continue to train hard every Tuesday evening and are always on the lookout and welcoming new players. The girls look forward to Fridays match, where they will come up against Kilmacud Crokes in âThe Game of light blitzââ¦ match report to follow. A special thanks to Naomh Barrog for hosting the match and to the parents for their continued support. It is very much appreciated. Orla Kavanagh, Tom Eekins, Gary McLoughlin, Colin Dowling, Gwen Downing, Edwina Mullan and Carol Dillon. Throw in at 12pm on Sunday 15th May 2016. The U11âs gathered together out in Naomh Olafs on Sunday morning. Foxcab U11âs were all prepared for the match. The girls arrived early, with sun cream on, water on board and ready to play football. Foxcab put out 3 teams against Naomh Olafâs. The match was 50 minutes long, making it 25 minutes aside. The girls found this tough especially in the warm weather conditions, but as always nothing gets in the way of these talented young ladies. The girls played out of their skin against a strong and physical Naomh Olafâs side. Foxcab didnât let the physicality bother them and displayed an excellent game full of team work through their football skills. All in all the girls enjoyed the match, and came out on top with 3 wins out of 3. The smiles amongst the players at the end of the match always reminds us as coaches why itâs all worth it in the end! A special thanks to Naomh Olafs for hosting the match and to the parents for their continued support. It is very much appreciated. The under 11 team management organised a team building activity on Saturday â a great idea to get the girls interacting in a different environment other than the training pitch, and a great chance to build stronger relationships between the girls within their age group. 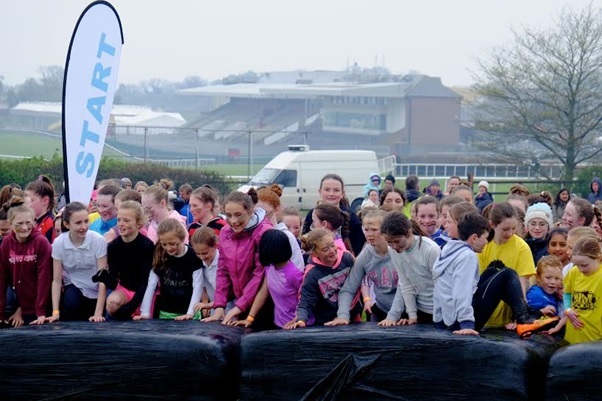 The activity picked was Mini Muckers, an exciting new obstacle Mud Run design specifically for kids. Believe it or not he was right as the cars pulled in the Punchestown Racecourse, the new venue for the Mini Muckers event, the rain stopped. The girls were divided in teams with the idea being that they must stay together as a group and finish as a group. This was a team event and all players in each group must help each other to get around the course. The important thing here is, that they don't leave their teammates behind and they must work together to encourage, motivate, help and maybe even drag each other around the course! There were over 20+ obstacles over 2.5Km of this grassland, water and mud course to overcome. There was a mix of log jumps to scramble over and under, a large moat, 2 water jumps, net scrambles, mud crawls, some mud pits and much much more. The girls had to work hard to stay in their groups to compete the course and they took this challenge in their stride. Fruit and refreshments were available as they cross the finish line and showers with hot water!!! Everyone has a wonderful mud filled experience as you can see by the pictures courtesy of Pat Ryan. All in all a very successful and enjoyable team day had by all. Thanks to all girls who took part and thanks again to all the parents for their support and we are also very appreciative of the work you do. The under 11 management have been instrumental in giving all players the opportunity to play a team sports and the development of skills in Gaelic football. Remember the under 11âs are always on the lookout for new girls to join the team. FoxCab U11s have played numerous games so far in the season including: Ballyboden St.Endas, Templeogue Synge Street, Naomh Olafs, Kilmacud Crokes, Shankill, Castle Knock, St. Oliver Plunketts, Blessington, Clontarf and Interclub Blitz before Easter. On Sunday Foxcab played against 2 Na Fianna teams away in Collinstown Lane pitch on Sunday 1st May. Each team had two teams consisting of 11 players each. The girls played one 25 minute game against one Na Fianna team and then another 25 minute game against the other team. The girls, have been focusing in training on the ability to work as a unit, where no one player was more important than another and where we relied on fast, accurate hand passing to move the ball around into space and above all maintain possession. They also have worked extremely hard on kick-passing and encouraging one another both on and of the pitch, which is wonderful to see. The girls showed this right from the beginning to end during the matches against Na Fianna. The under-11s produced an outstanding performance, with both teams excelling themselves in terms of passing, tackling, blocking, shooting and with well-worked team play, resulting in some very good scores. The smiling faces at the end of the match said it all. The hard work had paid off with two very successful matches. It was wonderful to hear the girls laughing and chatting about how well they played with one another, after the game. Thanks to all girls who travelled out to the match and took part, and thanks again to all the parents for their support. We are very appreciative of the work you do. Now it's back to the training ground on Tuesday evening at 6:30 in Killbogget to increase the intensity of our training through pad-work, core fitness and physical tackling drills. The U11 girls also look forward to a team bonding activity this weekendâ¦.. More to come from these young talented girls! 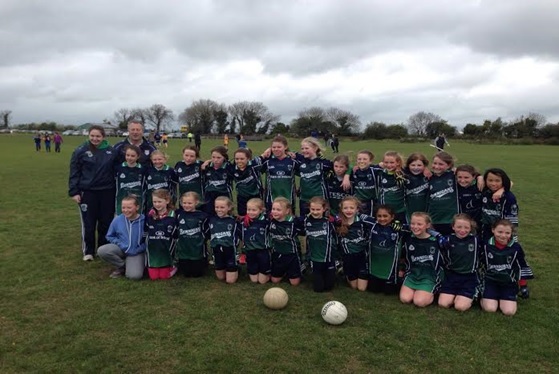 FoxCab U10s played a 4 team blitz in Kilbogget on Saturday 24th October. Clontarf turned up with two very strong teams and Cuala, Stars of Erin one team each. Fox Cab had 4 teams of 10 girls competing in two games per team. The girls, have been focusing in training on the ability to work as a unit, where no one player was more important than another and where we relied on fast, accurate hand passing to move the ball around into space and above all maintain possession. The under-10s produced an outstanding performance, with all 4 teams excelling themselves in terms of passing, tackling and with well-worked team play, resulting in some very good scores. The smiling faces at the end of Saturdayâs blitz said it all. The hard work had paid off with a very successful and enjoyable day. Now it's back to the training ground on Tuesday evening at 6:30 under lights in Kilbogget to increase the intensity of our training through pad-work, core fitness and physical tackling drills. The under 10 management have been instrumental in giving all players the opportunity to play team sports â (with every girl getting to play full games) - and in the development of the girls skills in Gaelic football. The under 10âs travelled with 3 teams to play Ballyboden St Endaâs on Saturday April 11th and were first meet with a hailstones shower, but this did not dampen their spirits. There were going to be no easy matches as Ballyboden St Endaâs are one of the biggest clubs on the south side, with over 70 girls in each age group. There were 9 games planed but only 6 were played due to the late start because of weather. All of Fox Cab teams showed great discipline regarding holding their positions well and putting up very solid defence to the point in 3 out of 6 games Ballyboden did not even put a score on the board. As the games progressed the girls started to move the ball very quickly up to the forwards who knew exactly what to do with it using both the space created and fast supply of ball to devastating effect, made life very difficult for Ballyboden who found it increasingly difficult to get out of their own half with the ball as the games progressed. What a great display of football entertainment given by our girls coming away with 6 wins out of 6. Thanks to all girls who took part and thanks again to all the parents for their support and we are also very appreciative of the work they do. Remember the under 10âs are always on the lookout for new girls to join the team. The under 10 teams are taking a well deserved break this Easter weekend after such a great start to the season with 3 wins out of 3 against Kilmacud Crokes, Cuala and Clontarf. Pictures from these games can be viewed here. Take it easy on the eggs girls!!! They will be returning to training in Kilbogget Park on Tuesday the 7 April at 6.45 in preparation for their next big blitz on Saturday the 11th April away to Ballyboden St Endas with a throw-in time of 2pm. The management are absolutely delighted with the girlâs magnificent performances and with the numbers turning up at training, the future looks good. They are always on the lookout for new girls to join the team.